Famous NZ landscape painter Grahame Sydney (in his role as outspoken opponent to Meridian's proposed wind farm on the Lammermoor Range in central Otago) has been saying some interesting things in recent interviews that give a revealing insight into how he views his artistic relationship with the NZ (particularly Otago) landscape. For instance in his written submission on behalf of the Maniototo Environmental Society to the Environment Court hearing back in 2008 Sydney wrote that "landscapes had a power and a meaning which was real, mysterious, andvital to many people's sense of identity. They play a vital role, aesthetic, cultural and spiritual, in the lives of New Zealanders." Sydney also claimed that "Central Otago landscapes had a greater capacity to affect people's imagination than most others in New Zealand." This could be the matter of some debate as arguably many NZers relate at least as strongly to a painting of a pohutukawa fringed beach or a view of Mt Cook as they might to a landscape in Central Otago. In another interview with the Dominion Post the painter is quoted as saying "What people don't get is that beauty does not have to be scenic majesty like mountains and lakes. There are many different types of beauty. Some people would look on this and just see bleak barren wasteland, but I see it as something unique and something very particular and special to Central Otago. I love it up here. I find it absolutely exhilarating." 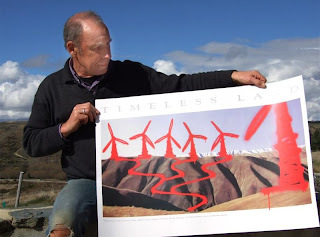 The picture shown here is Grahame Sydney with the graffiti style defaced print of Timeless Land - a 2008 fundraiser for the "Save Central" campaign formed to fight wind-farm development in the Central Otago landscapes that he loves to paint. [Photo Credit: Diane Brown ODT]. His defaced artwork was "a way of delivering the extent to which I feel the whole energy push is an insult to landscapes - especially ones I love the most, and the feeling that we have to make better decisions than this because the change to landscapes supposedly of a temporary nature, result in permanent damage, and there are better ways". The wind farm debate is an interesting battle between the needs of business and electricity consumers and those to whom the aesthetic appreciation of a landscape is the over-riding consideration. It is an intriguing twist in the story that artistic or aesthetic grounds would not have been made such an important factor in the opposition to the Central Otago windfarm development before the paintings of artists like Grahame Sydney! I bought a framed print of Grahame Sydney's Pig Root Pond about 6 years ago and have realised recently that the colour has faded out completely. I did not buy it from you, but I want to know why this may have happened and how to prevent it. I have non-reflective glass on the print, so thought this would offer some protection. It isn't in full sunlight, only gets direct light for about an hour a day over certain seasons of the year. I'm disappointed that this has happened and don't want it to happen again as this was a particular favourite of mine. Any ideas on whether I have recourse with the print "manufacturer" as the company I bought the print from is no longer in business. @Carolyn Grahame Sydney's prints of this era were published by Image Vault and printed by Rainbow Print. They did a very good job of printing this series of prints using lightfast modern inks and used good quality fine art paper. So there are a couple of reasons why your print of Sydney's painting "Pig Root Pond" did not last as long as it was designed to do (around 10 years under normal light conditions). Firstly non-reflective glass is not the same as UV glass. Non reflective glass eliminates the annoying glare that ordinary glass can create, the smaller the amount of reflection the less glare that results but does not affect the amount of UV filtered unless it also UV glass. More importantly the direct light that the print has been receiving, even only an hour a day for some of the year, is enough to fade a print due to the harsh NZ light conditions. UV glass would have slowed this process down a lot but fading is inevitable in direct light. As an aside New Zealand Fine Prints don't recommend UV glass for a reproduction print, the extra cost of UV glass is often more than the cost of a replacement print (a brand new copy of your favourite Pig Root Pond is only $NZ68) and reproductions can sometimes "fashion out" before modern prints begin to fade.